Introduction: In 2010, the Manitoba Dental Association launched its Free First Visit (FFV) program to provide dental screening for infants and toddlers. In this article, we review 3 years of FFV data submitted by participating dentists. Methods: Data from tracking forms were reviewed for children ≤?36 months of age. These forms include the age of the child at the time of their FFV, their home postal code and caries status. Descriptive and bivariate analyses were carried out, and postal code geomapping was completed. Results: Of the 8396 tracking forms submitted, 51.8% were for boys. The mean age at the time of the first visit was 24.2?± 7.8 months. Although only 8.5% had an FFV by 12 months, 26.7% had an FFV by 18 months. The average number of FFVs per month was 231.4?± 49.7. Postal code mapping revealed that participation was highest for children in the southern half of the province, including some high-needs neighbourhoods in Winnipeg. Pediatric dentists provided most FFVs and saw significantly younger children compared with general dentists (23.8?± 7.8 months of age vs. 25.2 ± 7.7 months, p?< 0.001). Conclusions: Although many Manitoba children have had an FFV, few visit a dentist by 12 months, as recommended by the dental profession. There is a need to improve the proportion of children visiting a dentist by the recommended age, and general practitioners should assume a greater role in providing this service. A past survey revealed that only 58% of Manitoba dentists were aware of the CDA's recommendation for a first visit no later than 12 months of age.6 Of those who saw preschool children in their practices, less than half (48.6%) were willing to see children before 1 year of age.6 The Manitoba Dental Association (MDA) reviewed the results of that survey and, subsequently, identified the need to implement a program to promote early visits. In April 2010, the MDA introduced its Free First Visit (FFV) program for a 3-year trial period (2010–2013). This program provides access to dental screenings for infants and toddlers ≤?36 months of age. The MDA developed promotional and educational resources for dentists and provided them with regular updates to prepare and equip them to see young children in their practices. This included tips on how to examine an infant or young child, what to discuss with parents and caregivers (e.g., anticipatory guidance on dietary practices and oral hygiene), understanding the factors contributing to ECC and overcoming practitioner reservations and anxiety about caring for young children. Not all of the MDA's registered dentists are participating, as their offices may not be suited for children. However, all members have been informed of the new recommendations for a first visit by 12 months of age and have been reminded that, if they have chosen not to participate, they still have a professional responsibility to ensure that young children are connected with other colleagues who are willing to open their offices and establish dental homes. To assist with an evaluation and assessment of the program, the MDA implemented an FFV tracking form system to collect data on each visit. The purpose of this study was to review FFV tracking form data from the 3 years of the program to determine the number of children using the program and the proportion visiting a dentist by the recommended age and to map where these children reside and where participating dental offices are located. This evaluation was approved by the MDA and the University of Manitoba's Health Research Ethics Board as part of a larger mixed-methods evaluation of the FFV program.11 This specific study involved analyzing FFV data collected in the program's tracking forms, which were completed and submitted by dental offices for each participating child. Tracking forms collected information on the age of the child at the time of their FFV, their home postal code, whether they displayed signs of ECC and whether they had dental insurance. The form also included information on the dentist and the postal code of the dental office providing the FFV screening. Tracking form data were entered into an Excel database (Microsoft Corp., Redmond, Wash.) and imported into Number Cruncher Statistical Software, version?8 (NCSS, Kaysville, Utah). Descriptive statistics included frequencies and means ± standard deviations (SD). Analysis of variance (ANOVA), t?tests and χ2 analyses were also performed. Rates of FFVs were calculated using population statistics for Manitoba children <?36 months. A p value ≤?0.05 was significant. Postal code geomapping was carried out by the Winnipeg Regional Health Authority's Research and Evaluation Unit using ArcGIS, version?10 (Esri, Redlands, Calif.) to locate participants' area of residence and dental office. During the 36 months of the program (1 April 2010 to 31 March 2013), 8396 tracking forms were submitted by over 141 dentists (12 pediatric and 129 general dentists); not all dentists provided their name and, thus, were not individually identifiable. The mean age of the children was 24.2?± 7.8 months (range 0.25–36.0 months) with an almost even distribution of boys (51.8%) and girls (48.2%). Participation was high during the first 6 months of the program: 647 in the first three months and 780 during months 4, 5, and 6 (Fig.?1). 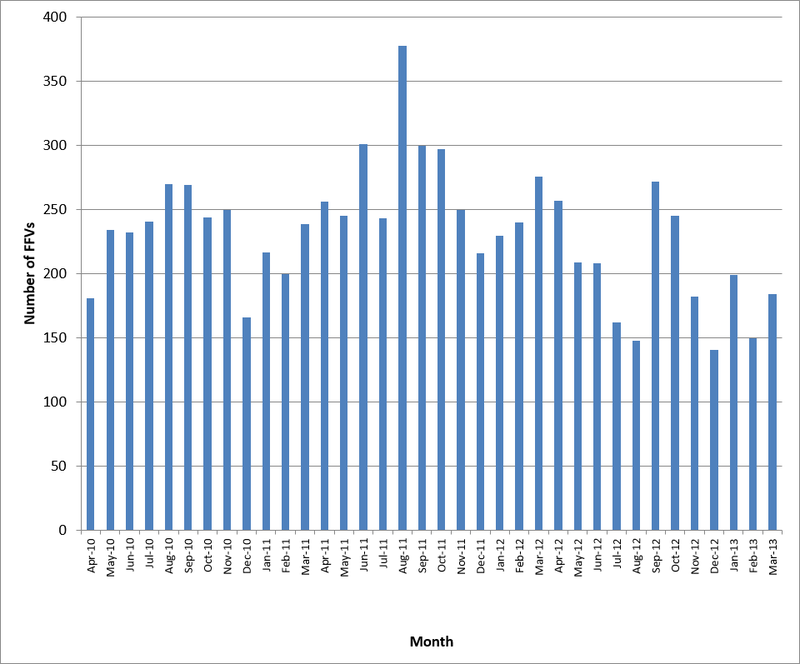 Monthly FFVs appear to have remained consistently high over time, ranging between141–378 per month. The average number of FFVs per month was 231.4 ± 49.7. Overall, 33.2% (n?= 2786) of visits occurred in the first fiscal year (2010/11), 38.7% (n?= 3248) in the second year and 28.1% (n?= 2362) in the third year. From the tracking form data, it appears that a small minority of children (8.5%) had a first dental visit at or before 12 months of age (Fig. 2). However, nearly 1 in 4 children had an FFV at or before 18 months of age (26.7%), and 44.5% of children had a visit before 24 months. ANOVA revealed a significant decrease in the mean age of children who received FFVs over the 3 years: 1st year, 24.7?± 7.5 months; 2nd year, 24.1?± 7.9 months; 3rd year, 23.6?±7.9 months; p?<?0.001. Figure 1: Number of dental visits per month by children participating in Manitoba's First Free Visit program. Figure 2: Age of children at their first dental visit under Manitoba's First Free Visit program. The majority (68.2%) of participating children lived in the Winnipeg region (Table 1). Similarly, most of the dentists who submitted forms were based in Winnipeg (65.6%). However, children residing in rural regions were also receiving FFVs to some extent. Table?2 reports the rates of FFVs by region of Manitoba determined by the child's postal code of residence. Participation rates in Winnipeg and the Interlake regional health authorities (RHAs) were higher than the provincial participation rate in each of the 3 study years. Table 1 Number of dental clinics and children participating in Manitoba's First Free Visit program by regional health authority. Churchill ? 1 (0.0) 2 (0.1) ? Table 2 Rates of participation by children in Manitoba's First Free Visit (FFV) program by regional health authority. No. FFV participants (per 1000 children)? ?Calculated using population statistics for children < 36 months of age from data provided by Manitoba Health for 2010, 2011 and 2012 respectively. Geomapping based on postal code data highlighted regional differences in the participation of children and dental offices. 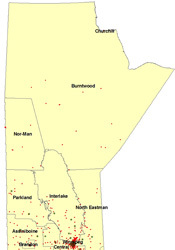 Although Winnipeg appeared to be a hub where many children obtain this service, the provincial map suggests that many children residing throughout the southern half of Manitoba have had an FFV (Fig. 3). Tracking form data suggest that children do not necessarily receive their FFV in the RHA in which they reside; many obtain this service elsewhere. However, it appears that various dental clinics interspersed in rural RHAs are also participating in the program. The map of Winnipeg (Fig. 4) reveals that even children in some of the highest needs community areas (such as Downtown, Point Douglas and Inkster) have received FFVs. Figure 3: Province-wide distribution of children and dental offices participating in Manitoba's Free First Visit program, 2010–13. 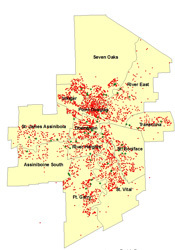 Figure 4: ?Distribution of children and dental offices participating in Manitoba's Free First Visit program, 2010–13, in metropolitan Winnipeg. For tracking forms that included the name of the dentist, we were able to determine the proportion of FFVs completed by general versus pediatric dentists. Overall, 78.6% (6409 of 8155) of FFVs were provided by pediatric dentists. Children seen by pediatric dentists were significantly younger than those seen by general dentists (23.8?± 7.8 months vs. 25.2?± 7.7 months, p?<?0.001). Surprisingly, most children (81.2%) receiving a FFV had some form of dental insurance. There was no association between the presence of dental benefits and the mean age at the time of the FFV (p?= 0.39). Based on submitted forms, 18.0% of children had ECC (1486 of 8238). Those identified with ECC at the FFV were significantly older than those who were reported not to have ECC (26.4?± 6.5 months vs. 23.7?± 8.0 months, p?< 0.001). Pediatric dentists saw significantly more children with ECC than general dentists (20.4% vs. 10.2%, p?< 0.001). Children with dental benefits were significantly more likely to have ECC (18.8% vs. 14.4%, p <?0.001). Analysis of FFV tracking form data over 36 months revealed that nearly 9000 infants and toddlers had participated in this program. Considering that some dentists may be providing this service, but are not completing the MDA's tracking form,11 our findings likely underestimate the true number. Based on responses to a recent survey of Manitoba dentists, as many as 5618 FFVs may have been conducted during the first 20 months of the program.11 The data also suggest that the volume of FFVs has stabilized over time. Despite the encouraging findings, this evaluation reveals that the MDA's program requires modifications to ensure that the recommendation of a first visit no later than 12 months of age becomes common practice. The proportion of children receiving an FFV by 12 months is disappointing. However, the FFV program is a first step in an ongoing process. Despite the small proportion of children who were 6–12 months of age and 12–18 months at the FFV, this is likely still an improvement over the number of children in those age groups who had their first dental visit in the past decade when these recommendations were not well known. We are unsure how many children who had an FFV would have had an early visit if the FFV program had not been implemented. However, the program has likely had a positive impact in terms of disseminating the importance of early visits. Our data provide a baseline from which to measure future advancements in promoting this concept. Changing the practice patterns of dentists takes time. First making dentists comfortable with young toddlers may be a useful strategy to prepare them and their offices for eventually becoming dental homes for infants up to 12 months of age.6,11,12 Over time, we hope that the proportion of children seen by 12 months increases. Our data suggest that there has been a modest, yet significant, reduction in the mean age at first visit in each of the 3 years examined. Another challenge that remains is how to ensure that infants and toddlers in all regions of the province find dental homes. FFV activities are more concentrated in southern regions of Manitoba and urban areas, reflecting the location of most dentists and a majority of the general population. The MDA should work with dentists in rural and northern regions to encourage their participation and promote the "come by 1" concept. If the profession is committed to early visits, the next step will be to increase participation in northern regions where the incidence and severity of ECC are often greatest. However, interagency cooperation will be needed, especially to reach First Nations children living on reserve. We have no available data from Health Canada on the number of these children who have had an early visit outside the FFV program. The hope is that some are benefiting from the Children's Oral Health Initiative. However, considering the ongoing high rates of pediatric dental surgery in these communities,9,10 there remains a significant uphill climb to curb the epidemic of ECC. Despite the fact that generalists may not have seen a large number of infants and toddlers, 129 still reported their activities to the MDA. Our previous work revealed that others participated in the FFV program, but did not submit tracking forms.11 Sixteen generalists reported seeing at least 25 children over the evaluation period, and 20 saw at least?20 children. This is remarkable considering their practices are not focused on pediatric care. These are positive first steps in a longer process to change clinical practice patterns that support infant and toddler oral health. An interesting finding was that, although participation in the FFV program meant that dentists provided visits at no charge, many children using it had dental insurance. This raises the issue of whether the program is reaching those at greatest risk. In reality, participation may be greater among middle- and upper-income groups, which could limit the number of opportunities for less-fortunate children.14 Insurers may be interested in the promotion of early visits, which can reduce the need for restorative and emergency care, therefore reducing dental-related costs among children.15 However, 1568 children without insurance received FFVs, and the map of Winnipeg suggests that children in disadvantaged neighbourhoods have participated. It is also possible that the program's promotional materials are geared toward middle- and upper-income groups or that lower-income groups may not be familiar with the program as their overall dental awareness may be limited. The FFV entails two concepts: promoting first dental visits and making these first visits free. One wonders whether the MDA should focus on promoting a first visit; then, for families who have no means to pay for care, dentists can decide to provide this initial visit to children at no cost. This evaluation project is not without limitations. First, only offices participating and submitting tracking forms were analyzed. This underestimates the true participation rate. It is likely that dentists are participating, but find that completing tracking forms is time consuming and, therefore, they do not report to the MDA.11 Another limitation relates to the tracking form itself, which only collected limited information about children and offices. It would have been useful to have asked about the type of insurance children qualified for (e.g. private insurance or government sponsored dental benefits such as Provincial Employment and Income Assistance/Social Assistance, Non-Insured Health Benefits from First Nations and Inuit Health Branch, or Interim Federal Health for government sponsored refugees). Information on the extent of decay also would have been useful to distinguish between children presenting with mild or severe ECC. This evaluation is part of a larger mixed-methods evaluation of the FFV program that involves a survey of general and pediatric dentists as well as focus groups of dentists and parents.11 Knowledge-exchange activities with the MDA and the profession have occurred. All of this information will assist the MDA and other decision-makers across Manitoba to determine the impact of the FFV program and how best to improve early access to oral health care to reduce the incidence of severe caries in young children. Future evaluations could explore whether the FFV program is associated with a reduction in the number of dental surgeries for severe ECC and whether the initiative leads to better and sustained access to dental care for preschool children. Dr. Schroth is associate professor, department of preventive dental science, college of dentistry, and department of pediatrics and child health, college of medicine, faculty of health sciences, University of Manitoba; and research scientist, Children's Hospital Research Institute of Manitoba, Winnipeg, Manitoba. Dr. G. Boparai is in private practice, Winnipeg, Manitoba. Dr. M. Boparai is in private practice, Brampton, Ontario. Dr. Zhang is senior data analyst, Winnipeg Regional Health Authority, Winnipeg, Manitoba. Dr. Svitlica is senior analytics specialist, Winnipeg Regional Health Authority, Winnipeg, Manitoba. Dr. Jacob is in private practice, Winnipeg, Manitoba. Dr. Stein is in private practice, Winnipeg, Manitoba. 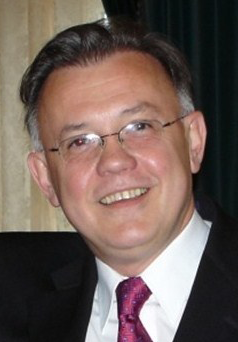 Dr. Lekic is professor, department of preventive dental science, college of dentistry, faculty of health sciences, University of Manitoba, Winnipeg, Manitoba. Acknowledgements: MB and GB received BSc(Dent) studentships from the Manitoba Dental Association. At the time of this study, RS held a Manitoba Medical Service Foundation and Manitoba Health Research Council Clinical Research Professorship in Population Medicine. Operating funds came from the Manitoba Institute of Child Health. The authors would like to recognize the support of the Manitoba Dental Association's Free First Visit Committee, participating Manitoba dentists, Children's Dental World and members of the Healthy Smile Happy Child partnership. Thank you to Betty-Anne Mittermuller for her assistance with data entry and database maintenance. American Academy of Pediatric Dentistry. Guideline on infant oral health care. Pediatr Dent. 2010;32:114-8. American Academy of Pediatric Dentistry. Policy on the dental home. Pediatr Dent. 2012;34:24-5. Darmawikarta D, Chen Y, Carsley?S, Birken?CS, Parkin?PC, Schroth?RJ, et al. Factors associated with dental care utilization in early childhood. Pediatrics. 2014;133(6):e1594-600. Schroth RJ, Cheba V. Determining the prevalence and risk factors for early childhood caries in a community dental health clinic. Pediatr Dent. 2007;29(5):387-96. Stijacic T, Schroth RJ, Lawrence?HP. Are Manitoba dentists aware of the recommendation for a first visit to the dentist by age?1 year? J?Can Dent Assoc. 2008;74(10):903. Schroth RJ, Smith PJ, Whalen?JC, Lekic?C, Moffatt?ME. 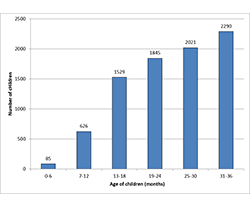 Prevalence of caries among preschool-aged children in a northern Manitoba community. J?Can Dent Assoc. 2005;71(1):27. Schroth RJ, Harrison?R, Lawrence?HP, Peressini?S. Conference report – Oral health and the Aboriginal child: a forum for community members, researchers and policy-makers. J?Can Dent Assoc. 2008;74(5):429-32. Schroth RJ, Pang JL, Levi JA, Martens PJ, Brownell MD. Trends in pediatric dental surgery for severe early childhood caries in Manitoba, Canada. J?Can Dent Assoc. 2014;80:e65. Canadian Institute for Health Information. Treatment of preventable dental cavities in preschoolers: a focus on day surgery under general anesthesia. Ottawa: CIHI; 2013:1-34. Schroth RJ, Yaffe?AB, Edwards?JM, Hai-Santiago?K, Ellis?M, Moffatt?ME, et al. Dentist's views on a province-wide campaign promoting early dental visits for young children. J?Can Dent Assoc. 2014;79:d138. Hussein AS, Schroth RJ, Abu-Hassan?MI. General dental practitioners' views on early childhood caries and timing of the first dental visit in Selangor, Malaysia. Asia Pac J Public Health. 2015;27(2):NP2326-38. Pariseau M. It's time for boot camp: promoting dental visits by age?1. J?Can Dent Assoc. 2012;78:c124. Jones K, Tomar SL. Estimated impact of competing policy recommendations for age of first dental visit. Pediatrics. 2005;115(4):906-14. Lee JY, Bouwens TJ, Savage?MF, Vann?WF?Jr. Examining the cost-effectiveness of early dental visits. Pediatr Dent. 2006;28(2):102-5. Disclaimer: CDA Oasis supports clinical decisions; however, it does not provide medical advice, diagnosis or treatment. CDA Oasis is intended to serve as a rapidly accessible, initial clinical reference resource and not as a complete reference resource. All statements of opinion and supposed fact are published on the authority of the author who submits them and do not necessarily express the views of the Canadian Dental Association. The editor reserves the right to edit all copy submitted to CDA Oasis. Publications of an advertisement does not necessarily imply that the Canadian Dental Association agrees with or supports the claims.